Nowadays cooperation with foreign partners (maritime educational institutions, scientific establishments and scientific and engineering institutions, shipping and crewing companies), as well as upgrading the quality of training process and meeting the international standards takes an important place in the work of Odesa National Maritime Academy. During the period from 1990 to 1991 a significant work in the foreign affairs and commercial activity was held in Odesa Higher Engineering Marine School. 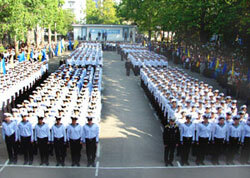 Due to transformation of OHEMS into Odesa State Maritime Academy for the enhancement of scientific and technical, economic cooperation of the Academy with foreign institutions and organizations, international and economic relationships development and commercial activity, International and Economic Cooperation Department was organized in August 29,1991 with the decree № 166. The system of seafarers training meets the standards of the International Convention on Standards of Training, Certification and Watchkeeping for Seafarers,1978, as amended,1995(STCW 78 as amended). In addition to diploma of higher education, all cadets obtain the Certificates of Competency which enables them to apply for a position of officers on board vessels of any shipping company of the world. The Academy's specialists' level of training meets the requirements of International Maritime Organization (IMO). ONMA keeps in touch with the United Nations' International Maritime Organization, specialized agency (London, Great Britain). The Academy elaborated a number of documents from the part of Ukraine and takes part in the work of sessions, committees and sub-committees. Academy's professors and lecturers participate in the work of International Maritime Organization as competent persons (experts). 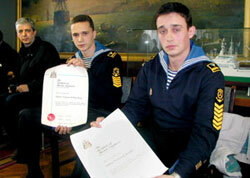 Odesa National Maritime Academy's activity has met with wide international recognition. Expertise of crew members' training at ONMA (demands' assessment and planning mission within the framework of integrated technical cooperation programme) was held by International Maritime Organization's experts' group in 1996. The experts expressed their appreciation of crew specialists of sea- and river-going transport training quality. 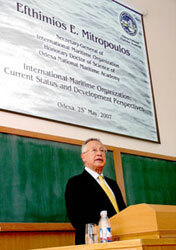 In May 2007 Efthimios Mitropoulos, Secretary-General of International Maritime Organization, was on an official visit in Ukraine. The main aim of Mr. Mitropoulos's visit was familiarization with the marine industry in our country. 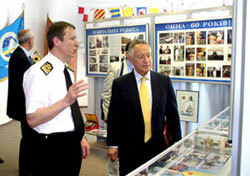 Mr. E.Mitropoulos visited Odesa National Maritime Academy where his meeting with Academy's staff took place. During the meeting IMO Secretary-General was conferred on a title of Honorary Doctor of Odesa National Maritime Academy. Besides, Academy's teaching staff, cadets and representatives of Ukrainian Maritime Community had an opportunity to be present at Mr. E.Mitropoulos lecture devoted to the following subject "International Maritime Organization: contemporary condition and development perspectives". There was a press-conference of Efthimios Mitropoulos, International Maritime Organization's Secretary-General with mass media representatives at the the end of formal events. Main specialists of faculties and specialities ("Ship's Power Plants Operation", "Automated Control of Technical Processes", "Radio-Electronic Devices, Systems and Complexes", "Electric Systems and Complexes of Transport Means") collaborate actively with their English colleagues. 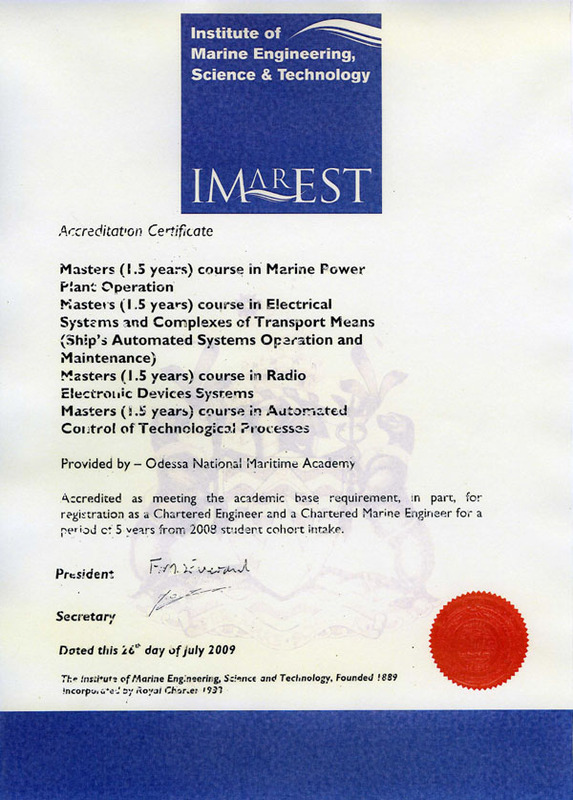 IMarEST is the greatest world's association of Maritime Engineers founded in Great Britain in 1889 for enhancing professional growth and scientific development of specialists in the field of ship's technical means. 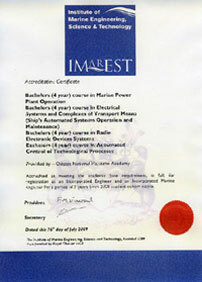 IMarEST comprises about 15000 members in more than 100 countries of the world. In 1992 Odesa State Maritime Academy (now ONMA) and Black Sea STT of water transport concluded a cooperation agreement with IMarE ( now IMarEST). In 1998 Ukrainian branch of the Institute was founded on the base of the Academy which comprises 200 members among which there are ship's engineers, professors, lecturers and students of the Academy. "English Club", founded on the base of the Academy, allows young specialists to improve their professional language skills, to be aware of the latest scientific and technical achievements, to use technical journals, Institute's bulletins and other recent scientific and technical literature. Besides, members of the Institute participate in the work of conferences, seminars and meetings in Ukraine, Great Britain and other countries. In 1996 the expert commission of this Institute carried accreditation of out ONMA specialities. The Commission adjusted the level and scope of speciality training programs' to meet international requirements of ship's crew training and expressed their approval for giving the Academy the highest (Chartered Engineer) accreditation level. The Council of Institute of Marine Engineering, Science and Technology considered the experts' review and gave the Academy the first (highest) category Accreditation Certificate of British Technical Council. In 2004 ONMA underwent accreditation of Engineering specialities again, which was carried out by experts in accordance with the new standards of education requirements for University training highest category. In 2009 ONMA Engineering Specialities went through accreditation procedure on correspondence to the requirements for University training of the highest category for the third time. Incorporated Engineer (lEng) corresponds to the bachelor's qualification or to the national diploma of higher education. Its holder possesses effective skills necessary for technical and commercial management. Incorporated Engineer is characterized by the ability to act in accordance with new technology, using creative and innovative approaches. Engineering Technician (EngTech) corresponds to the qualification of national diploma. Its holder accepts the approved methods and procedures for solving practical problems in a certain technology field. The cooperation between ONMA and IMarEST results in that our scientists, leading teachers and cadets became members of this Institute. Every year, cadets and postgraduate students of the Academy get single personal grants of the Institute. The State Examination Commissions, faculty councils and members of the Institute can recommend worthy graduates and cadets to become IMarEST members in the accredited specialties. After completion of educational and professional youth development, the specialists can be registered in the Technical Council of Great Britain and they can be issued an English certificate in the following qualifications: Chartered Engineer which corresponds to the Master's diploma, Incorporated Engineer that corresponds to the Bachelor's diploma of universities and academies of Great Britain, the USA and other countries. The Nautical Institute of Great Britain (NI), London, Great Britain is one of the important non-governmental organizations that unites marine navigation officers and other specialists working in marine shipping sphere. 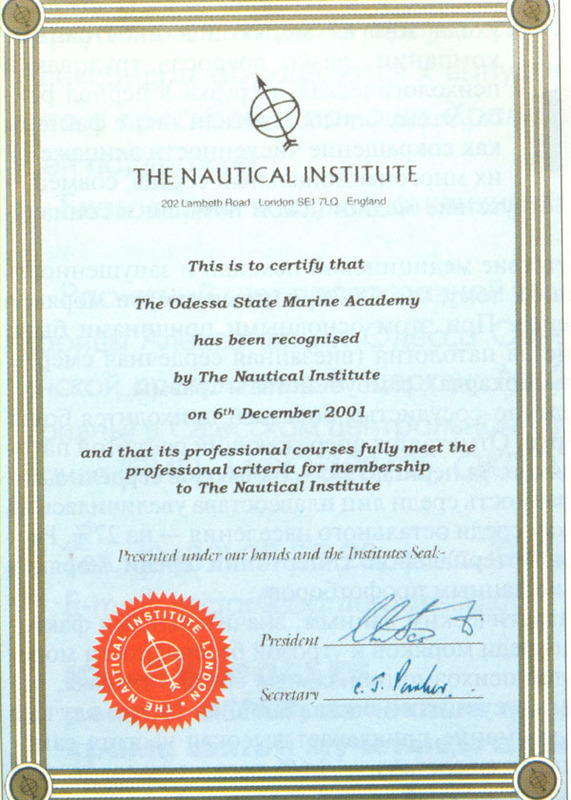 In October 2000, a branch of Nautical Institute of Great Britain was opened on the basis of Odessa State National Academy (now ONMA). This became a great event for the maritime collaboration of Ukraine. The Nautical Institute of Great Britain (NI) is one of the most famous, authoritative and active public organization in the field of maritime shipping. Besides located in London headquarters and other bodies in Great Britain, it has more than 45 branches in different regions of the world. NI publishes monthly international journal «Seaways», numerous books and publications, organizes seminars and conferences for the fleet officers on the pressing shipping problems. The opening of NI branch in our country is the recognition of the huge Ukraine's potential in the field of maritime transport by the world marine community and the high assessment of our marine specialists' (scientists, seafarers, port workers) professionalism and achievements. At the same time, NI membership gives our specialists access to the information of all kinds about the problems, tendencies, modern achievements in the shipping world. It's a chance to take part in the events that are held by the Institute on the international level, relating the level of professional activity. The main objectives of the newly established NI branch were to spread widely in the maritime circles of Ukraine the information about the processes in the shipping industry, the foreground tasks of researches and developments, the latest achievements and unsolved problems in maritime field and also to develop cooperation and exchange of experience, to broaden our specialists' outlook, to get new knowledge on special NI programmes. On the 22nd of March 2001, the organization was registered as a public one and it got the name "Nautical Institute of Ukraine (NIU)". At present, NIU is a large authoritative organization in the shipping world that numbers more than 150 members not only from Ukraine but also from the Commonwealth of Independent States, Lithuania, Lebanon, India, etc. NIU acts on the basis of the statute. The governing body is the Committee and at its meetings different current problems and prospective organization's tasks are discussed, relevant decisions are made. Every year, the general meeting of Institute members is held. At the request of NIU and ONMA, the Nautical Institute of Great Britain has carried out the accreditation of ONMA navigators' training correspondence to the international requirements and criteria of the NI membership, and the proper certificate has been received. At the request of the Deputy Minister of Transport and Connection of Ukraine, the training courses for the specialists in the field of maritime accidents investigation matters were held in ONMA with the participation of NIU members in June 2008. The proper certificate has been granted. NIU Committee members were included in the Ukrainian delegation and participated in the work of IMO subcommittee on seafarers training and watchkeeping. They also visited many times the NI headquarters in London in order to strengthen many-sided ties with the main Institute. The NIU Committee pays great attention to the development of cooperation between the Institute and other maritime organizations in Ukraine as well as abroad. For example, NIU established long-term partnership with the Regional Administration of Russian Maritime Register of Shipping in Ukraine. The NIU members participate in the annual seminars and "round" tables which are organized by the Register on subject "Shipping safety, environment protection and safety at sea". In their turn, the Administration specialists make reports at the events conducted by NIU. A number of books and practical manuals on the subject were prepared and published in common. 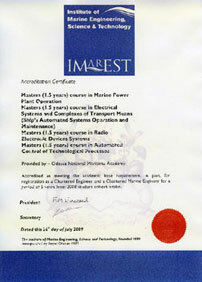 The constant information exchange and participation in different activities are conducted by NIU with such organizations as the International Academy of Ecology, Man and Nature Protection Sciences, the Association of Odesa Marine Captains, the Institute of Advanced Studies for Water Transport Workers, the Office of Classification Society "Veritas" in Ukraine, the Inspectorate for Training and Certifying of seafarers, the South Scientific Centre of the Transport Academy of Ukraine, the Greek Association on Sea Protection (HEMEPA), etc. 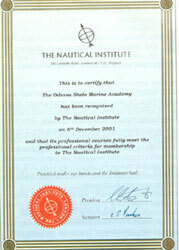 The Nautical Institute of Ukraine takes active part in spreading in the maritime society of our country the ideas and principles of mankind stable development, which were stated in the Declaration - the final document of the UN International Conference on environmental and development matters (Rio de Janeiro, July, 1992), forming of ecological culture elements in seafarers, care of nature. Numerous publications in the journal "Sea Review" are dedicated to the different aspects of marine pollution prevention. They were discussed at the conferences and "round" tables that were held on the initiative of NIU during last years. 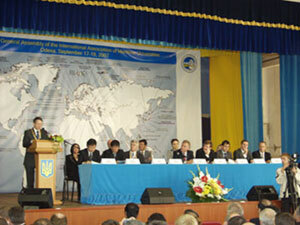 Thus, the members constituent assembly of a new for Ukraine public organization UKRMEP took place in December 2007. UKRMEP is a national association on prevention of pollution at sea that was created by analogy to the well-known all over the world Greek association and NIU was one of those taking the lead in its establishment. UKRMEP was called to combine efforts of all those relating to sea in the active struggle for keeping the sea unpolluted. For our association it's the Black Sea and the Azov Sea that should be protected from pollution caused by shipping. 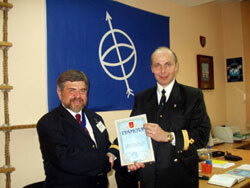 The NIU's rising authority in the world of shipping is confirmed by the obtained awards given by the Nautical Institute, such as Blue, Siver and Gold Award for active work on increasing the membership of the Institute, for inviting to participate in different projects organized by Ukrainian and Russian law firms (International Law Service, Ukraine; "Remedy", Russian Federation), for inviting to join the elite forum «The International Maritime Institutes» that is a collective community of all the maritime institutions of the world which facilitates their interconnection and cooperation. In 1999 under the auspices of Japanese institution «The Nippon Foundation», with the support of the International Maritime Organization, the world leading educational establishments founded the International Association of Maritime Universities (IAMU). 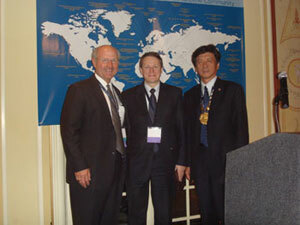 Nowadays the Association includes 51 maritime educational establishments from 30 countries of the world. 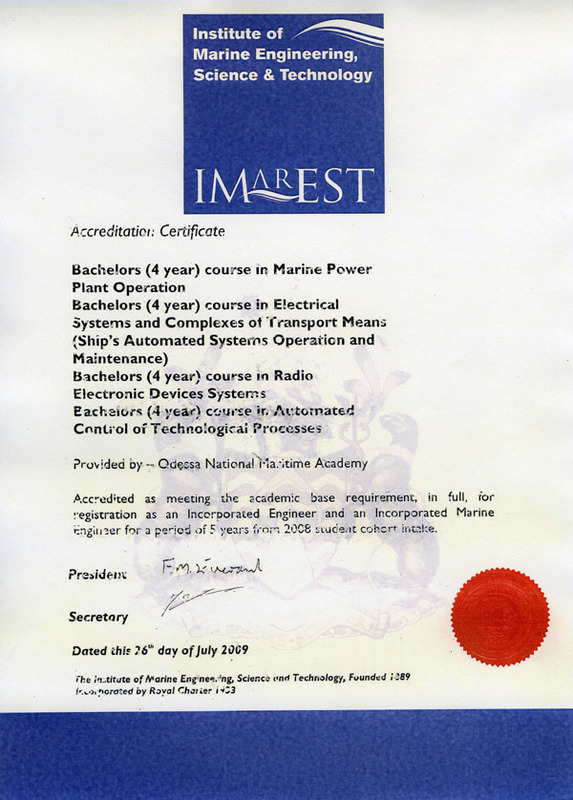 The main criterion for the membership is the availability of at least 4-years course of training for Bachelor Degree at the educational establishment, that provides the possibility of obtaining Watch Officer Diploma (Certificate), as well as the additional programs and conditions for Master, Doctor of Philosophy and Doctor of Science educational level achievement in the field of maritime industry. Taking into consideration that human factor is the main one that influences safety in the maritime industry, the Association pays much attention to officers' education and training. The main Association's objectives are the following: the overall maritime educational and training system development for the following generations; effective safety control system implementation for the international maritime industry; standard syllabus, maritime education programs and the international seafarers certification system development and introduction. creates the international student network among the members of the Association. 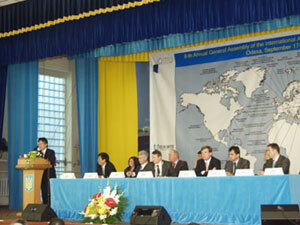 Since the day of Association's foundation Odesa National Maritime Academy has taken active part in its activities. Since 2000 ONMA's Rector has been the member of the International Executive Committee of the Association. In 2003-2004 the Association's working team dealing with maritime safety and security management systems was led by ONMA. In 2005-2006 the Association's working group dealing with shipboard LNG carrier training was led by ONMA. During the period between the Annual General Assemblies the Association's activity is carried out by the working groups, financial committee, Association's politics committee, publishing committee etc. Their work is directed at maritime educational system and shipping safety management system development, as well as at globalization and standardization of maritime educational system. ONMA's experts participate in the Association's activities and in the work of all the General Assemblies that take part on the basis of the universities which are the members of IAMU. 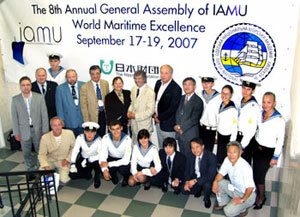 In September, 2007 the 8th Annual IAMU "World Maritime Excellence" General Assembly took place at Odessa National Maritime Academy. The main subjects were the following: maritime education standards and IAMU training introduction; IAMU's inquiry answers to the maritime industry; the review of the International Convention and Code on Standards of Training, Certification and Watchkeeping for Seafarers. During the Assembly an interesting and eventful program was carried out for the cadets. It included scientific lectures, simulators use competency demonstration, proficiency in the English language contests. The great organizational work preceded the 8th General Assembly. The decision about the place of holding is usually made by the executive committee of the Association. As a result of the executive committee's members' secret voting the educational establishment where the following Assembly is to take place is chosen from the others. It should be remembered that the first attempt to organize the Assembly at ONMA was made in October, 2005 in Malmц, Sweden, during the 6th General Assembly of the Association. However, according to the results of the secret voting the honour of holding the following Assembly fell on Dailan Maritime University of PRC. The next attempt turned out much more successful. 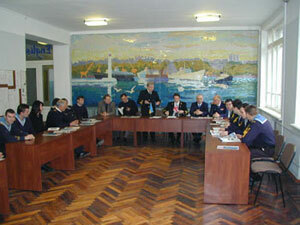 In March, 2006 during the meeting of the Association's Executive Committee it was decided to organize the 8th General Assembly of the Association on the basis of Odesa National Maritime Academy in September, 2007. This resolution was confirmed by the 7th General Assembly in October, 2006.
the number of domestic issues of the Association was also examined. 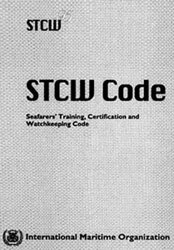 the review of the International Convention and Code on Standards of Training, Certification and Watchkeeping for Seafarers etc. Alongside with the Assembly the interesting and eventful programme was carried out. The cadets and the students of the educational establishments of the Association also took part in it. The educational basis of the Academy was widely used for cadets' programme realization. The cadets were accommodated on the sailing ship "Druzhba". The motto of students' program was "One Earth – one team". The program included the cadets' speeches on the scientific subjects, the navigational simulator and ships power plants operating skills demonstration and business English games. On the day of the Assembly's closing all the participants were rewarded with honorable diplomas. It should be mentioned that the 8th Annual IAMU General Assembly became the important milestone in the development of maritime education that demonstrates the high level of maritime higher education in Ukraine to the maritime community.